Bristol is an English city and county and one of the three administrative centres of South West England (the others being Plymouth and Exeter). From its earliest days, its prosperity has been linked to that of the Port of Bristol, the commercial port which originated in the city centre, but which has now moved to the Bristol Channel coast at Avonmouth and Portbury. Bristol is England's eighth, and the United Kingdom's eleventh, most populous city. As such, it is one of England's core cities. 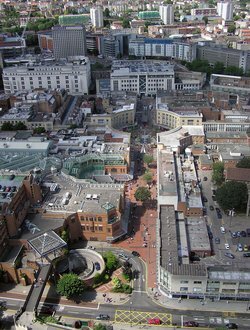 For half a millennium Bristol had been the second largest English city after London, until the rapid rise of Liverpool, Manchester and Birmingham, in the 1780s. The Avon traditionally marks the border between gloucestershire and Somerset. In 1373 Edward III of England proclaimed "that the said town of Bristol withall be a County by itself and called the county of Bristol for ever", but maps usually show it as part of Gloucestershire, and as the city spilled south of the river, it took the county with it. 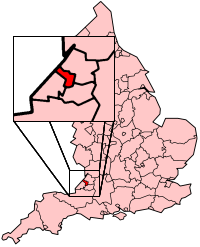 In 1974 Bristol became a district of the newly formed administrative County of Avon. When that county was abolished on the 1st April 1996, Bristol returned to its former status of a city and county in itself. The city borders on the unitary districts of Bath and North East Somerset, North Somerset and South Gloucestershire. The town of Brycgstow (Old English, "the place at the bridge") was in existence by the beginning of the 11th Century, and under Norman rule acquired one of the strongest castles in southern England. 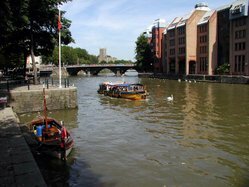 The River Avon in the city centre has slowly evolved into Bristol Harbour, and since the 12th Century the harbour has been an important port, handling much of England's trade with Ireland. In 1247 a new bridge was built and the town was extended to incorporate neighbouring suburbs, becoming in 1373 a county in its own right. During this period Bristol also became a centre of shipbuilding and manufacturing. By the 14th Century Bristol was England's third-largest town (after London and York), with perhaps 15-20,000 inhabitants on the eve of the Black Death of 1348-49. The plague inflicted a prolonged pause in the population growth of Bristol, with numbers remaining at 10-12,000 through most of the 15th and 16th Centuries. 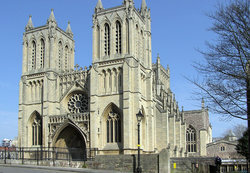 Bristol was made a city in 1542, with the former Abbey of St Augustine becoming Bristol Cathedral. During the Civil War the city suffered (1643-45) through Royalist military occupation and plague. In 1497 Bristol was the starting point for John Cabot's voyage of exploration to North America. Renewed growth came with the 17th Century rise of England's American colonies and the rapid 18th Century expansion of England's part in the Atlantic trade in Africans taken for slavery in the Americas. Bristol, along with Liverpool, became a significant centre for the slave trade although few slaves were brought to Britain. During the height of the slave trade, from 1700 to 1807, more than 2000 slaving ships were fitted out at Bristol, carrying a (conservatively) estimated half a million people from Africa to the Americas and slavery. Competition from Liverpool from c.1760, the disruption of maritime commerce through war with France (1793) and the abolition of the slave trade (1807) contributed to the city's failure to keep pace with the newer manufacturing centres of the north and midlands. The long passage up the heavily tidal Avon Gorge, which had made the port highly secure during the middle ages, had become a liability which the construction of a new "Floating Harbour" (designed by William Jessop) in 1804-9 failed to overcome. Nevertheless, Bristol's population (66,000 in 1801) quintupled during the 19th Century, supported by new industries and growing commerce. It was particularly associated with the leading engineer Isambard Kingdom Brunel, who designed the Great Western Railway between Bristol and London, two pioneering Bristol-built steamships, and the Clifton Suspension Bridge. Bristol's city centre suffered severe damage from bombing during World War II. The original central area, near the bridge and castle, is still a park featuring two bombed out churches and some tiny fragments of the castle. (A third bombed church has a new lease of life as St Nicholas' Church Museum.) Slightly to the North, the Broadmead shopping centre was built over bomb-damaged areas. The removal of the docks to Avonmouth, seven miles (11 km) downstream from the city centre, relieved congestion in the central zone and allowed substantial redevelopment of the old central dock area (the "Floating Harbour") in recent decades, although at one time the continued existence of the docks was in jeopardy as it was seen merely as derelict industry rather than a potential asset. On March 4, 2005, Bristol was granted Fairtrade City status. In the 20th century, Bristol's manufacturing activities expanded to include aircraft production at Filton, six miles (10 km) north of the city centre, by the Bristol Aeroplane Company, and aero-engine manufacture by Bristol Aero Engines (later Rolls-Royce) at Patchway. The aeroplane company became famous for the WWI Bristol Fighter, and Second World War Blenheim and Beaufighter aircraft. In the 1950s it became one of the country's major manufacturers of civil aircraft, with the Bristol Freighter and Britannia and the huge Brabazon airliner. 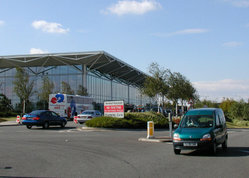 In the 1960s Filton played a key role in the Anglo-French Concorde supersonic airliner project. Concorde components were manufactured in British and French factories and shipped to the two final assembly plants by road, sea and air. The French assembly lines were in Toulouse in southern France with the British lines in Filton. Luckily the very large three-bay hangar built for the Bristol Brabazon was available for Concorde production. The last ever flight of any Concorde, 26 November 2003. The aircraft is seen a few minutes before landing on the Filton runway from which she first flew in 1979. The French manufactured the centre fuselage and centre wing and the British the nose, rear fuselage, fin and wingtips. The largest proportion of the British share of the work was the powerplant, the Rolls-Royce/Snecma 593. The engine's manufacture was split between British Aircraft Corporation, Rolls-Royce (Filton) and SNECMA at Villaroche near Paris. 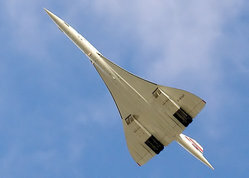 The British Concorde prototype G-BSST made its 22 minute maiden flight from Filton to RAF Fairford on 9 April 1969, the French prototype F-WTSS had flown from Toulouse five weeks earlier. Most of the employees of BAC and Rolls Royce, plus a huge crowd, watched from around the airfield. Fairford was chosen as the test airfield for Concorde because the runway at Filton was rejected for test flying, its length was inadequate and there were problems with the slope, and the first 1000 feet (300 m) of the runway at its eastern (A38) end could not be used. However, from the end of 1977, all test flying on the second production aircraft G-BBDG was done from Filton, following the closure of the BAC Fairford test base. In 2003 the two airlines using Concorde (British Airways and Air France) and the company supplying spares and support (Airbus) made the decision to cease flying the aircraft and to retire them to locations (mostly museums) around the world. On 26 November 2003, Concorde 216 (G-BOAF) made the final ever Concorde flight, returning to Filton airfield to be kept there permanently as the centrepiece of a projected air museum. This museum will include the existing Bristol Aero Collection which is currently kept in a hangar at Kemble Airfield, forty miles (60 km) from Filton. This collection includes a Bristol Britannia aircraft. The major aeronautical companies in Bristol now are BAE Systems, Airbus and Rolls-Royce, both based at Filton. Another important aeronautical company in the city is Cameron Balloons, the world's largest manufacturer of hot air balloons. Annually, in August, the city is host to the Bristol International Balloon Fiesta, one of Europe's largest hot air balloon events. The Bristol Aeroplane Company diversified into car manufacturing in the 1940s, building luxury hand-built cars at their factory in Filton. The car manufacturer became independent from the Bristol Aeroplane Company in 1960. The city has two significant football clubs: Bristol City F.C. who play in Football League One and Bristol Rovers F.C. who play in Football League Two. The city is also home to a Rugby Union club known as Bristol Rugby, who have won promotion to the Guinness Premiership, and a first-class cricket side, Gloucestershire C.C.C. In summer the grounds of Ashton Court to the west of the city play host to the Bristol Balloon Fiesta, a major event for hot-air ballooning in Britain. The Fiesta draws a substantial crowd even for the early morning lift that typically begins at about 6.30 am and a fairground atmosphere is sustained throughout the day. A second mass ascent is normally scheduled for the early evening, again taking advantage of lower wind speeds. Ashton Court also plays host to the Ashton Court festival each summer, an outdoors music festival which used to be known as the Bristol Community Festival. The city's principal theatre company, the Bristol Old Vic, was founded in 1946 as an offshoot of the Old Vic company in London. Its premises on King Street consist of the 1766 Theatre Royal (400 seats), a modern studio theatre called the New Vic (150 seats), and foyer and bar areas in the adjacent Coopers' Hall (built 1743). The Theatre Royal is a grade I listed building and the oldest continuously-operating theatre in England. The Bristol Old Vic also runs a prominent Theatre School. The Bristol Hippodrome is a larger theatre (1981 seats) which hosts national touring productions, while the 2000-seat Colston Hall, named after Edward Colston, is the city's main concert venue. The music scene is thriving and significant. From the late 1970's onwards it was home to a crop of cultish bands combining punk, funk, dub and political consciousness, the most celebrated being The Pop Group. Ten years later, Bristol was the birthplace of a type of English hip-hop music called trip hop or the Bristol Sound, epitomised in the work of artists such as Tricky, Portishead, Smith & Mighty and Massive Attack. It is also a stronghold of drum n bass with notable bands like the Mercury Prize winning Roni Size/Reprazent and the woefully cynical Kosheen as well as the pioneering likes of DJ Krust and More Rockers. This music is part of the wider Bristol Urban Culture scene which received huge international media attention in the 1990s and still thrives under the radar today. Bristol's fiercely independent, pioneering spirit continues and in the early 21st Century is home to one of the largest and most diverse DIY music communities in the UK. Artists such as Gravenhurst and Chikinki have revived popular interest over the past few years while a crop of highly influential cult acts such as Wall Planner, Pricktaster and November's ashes in rain continue to inspire a kind of smug civic pride. A dynamic community of bands, artists, promoters and music fans has developed around the Choke forum, named after a popular fanzine and club night which has championed underground music from Bristol and beyond since 2001. Bristol is home to many live music venues, of which The Old Duke is perhaps the best known. Internationally recognised jazz and blues musicians active in Bristol include Eddie Martin, Jim Blomfield and Andy Sheppard. The Bristol City Museum and Art Gallery houses a collection of natural history, archaeology, local glassware, Chinese ceramics and art. 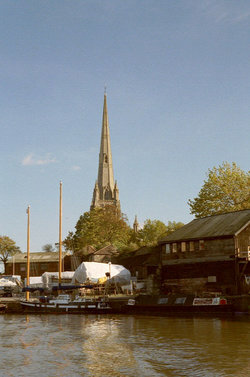 The Bristol Industrial Museum, on the dockside, shows local industrial heritage and operates a steam railway, boat trips, and working dockside cranes. The City Museum also runs three preserved historic houses: the Tudor Red Lodge, the Georgian House, and Blaise Castle House. The Watershed media centre and Arnolfini gallery, both in disused dockside warehouses, exhibit contemporary art, photography and cinema. Stop frame animation films and commercials painstakingly produced by Aardman Animations and high quality television series focusing on the natural world have also brought fame and artistic credit to the city. Bristol is where the British Broadcasting Corporation (BBC) has its regional headquarters, and Natural History Unit. Bristol is also the birthplace of the actor Cary Grant. Bristol is the home of a regional morning newspaper, the Western Daily Press, a local evening paper, the Evening Post and a weekly free newspaper, the Bristol Observer. A Bristol edition of Metro is distributed for free on buses in the area. The local listings magazine, Venue, is now published weekly after many years as a fortnightly publication and comprehensively covers the city's music, theatre and arts scenes. The Spark magazine (Since 1993) covers the surging interest in all things green, ethical and New Age. Bristol indymedia is a resource for Bristols anarchist and activist community and is the sixth largest website associated with the city. Bristol is home to two major institutions of higher education: the University of Bristol, a "redbrick" chartered in 1909, and the University of the West of England, formerly Bristol Polytechnic, which gained university status in 1992. The city also has two dedicated further education institutions, City of Bristol College and Filton College as well as a theological college, Trinity College, Bristol. The Create centre is home to many sustainable development projects and life long learning schemes. It has 129 primary schools and three city learning centres. There are two principal railway stations in Bristol: Bristol Parkway and Bristol Temple Meads. Bristol was never well served by suburban railways, though the Severn Beach Line to Avonmouth and Severn Beach survived the Beeching Axe and is still in operation today. The Portishead Railway was closed in the Beeching Axe but was relaid between 2000-2002 as far as the Royal Portbury Dock with a Strategic Rail Authority rail-freight grant. Plans to relay a further three miles of track to Portishead, a largely dormitory town with only one connecting road, have been discussed but there is insufficient funding to rebuild stations. Long-standing plans for a light rail system in the Bristol area have not so far succeeded, and as a consequence public transport within the city is still largely bus based. The majority of the local bus service is operated by First_Group. The central part of the city also has water-based routes, operated as the Bristol Ferry Boat, which provide both leisure and commuter services on the harbour. The city is connected by road on an east-west axis from London to Wales by the M4 motorway, and on a north-southwest axis from Birmingham to Exeter by the M5 motorway. The M32 motorway is a spur from the M4 to the city centre. The city is also served by its own airport (BRS), at Lulsgate, which has recently seen substantial improvements to its runway, terminal and other facilities. Despite being hilly, Bristol is one of the prominent cycling cities of England, and is home to the national cycle campaigning group Sustrans. It has a number of urban cycle routes, as well as links to National Cycle Network routes to Bath and London, to Gloucester and Wales, and to the south-western peninsula of England. Many Bristolians speak a distinctive dialect of English (known colloquially as Brizzle or Bristle). Uniquely for an urban area of Britain, this is a rhotic dialect, in which the r in words like car is pronounced. The most unusual feature of this dialect, unique to Bristol, is the Bristol L (or Terminal L), in which an L sound is appended to words that end in a letter a. Thus "area" becomes "areal", etc. This may lead to confusions between expressions like area engineer and aerial engineer which in "Bristle" sound identical. Other examples include 'Americal' and 'Canadal', and, when unsure, the answer 'I have no ideal'. In the same way, the Swedish Ikea is known by some as 'Ikeal'. The following is a list of the areas and towns that make up the city of Bristol and its outskirts. It includes some adjoining areas of South Gloucestershire, marked SG. Many notable people have been associated with Bristol, including musicians, engineers, scientists, sailors and explorers. Isambard Kingdom Brunel came to Bristol to build the Clifton Suspension Bridge, and went on to be the engineer of the Great Western Railway and the designer of the SS Great Western. Edmund Burke was Member of Parliament for the city for six years from 1774. He famously insisted that he was a Member of Parliament first, rather than a representative of his constituents' interests. John Cabot set sail from Bristol in 1497 in search of exotic goods from the far east, but instead discovered North America. He first sighted Newfoundland, today a province of Canada. Sir Humphry Davy was a scientist who worked in Hotwells and discovered laughing gas. Francis Greenway was an architect and convict who was transported to Australia in 1814 and subsequently built many of the early iconic buildings of the city of Sydney. John Harvey founded the Bristol wine merchants John Harvey & Sons, and their sherry brand Harvey's Bristol Cream has taken the name of Bristol all over the world. Famous musicians native to Bristol include Roni Size, Tricky and Massive Attack. The group Portishead is based in the city, and the band's name and roots come from the neighbouring town. Samuel Plimsoll, 'the Sailor's friend' campaigned fearlessly to make the seas safer. He was shocked by the scandal of overloaded cargoes and successfully fought for a compulsory loadline on ships - the Plimsoll line during Disraeli's Conservative Government (1874-80). Wallace and Gromit; heroes of the animation world and stars of the Oscar-winning 'The Wrong Trousers', 'A Grand Day Out', 'A Close Shave' and 'The Curse of the Were-Rabbit' were created in Bristol by Aardman Animations. Svetlana Alliluyeva, Stalin's daughter, lived briefly in Bristol in the early 1990s. John Wesley founded the very first Methodist Chapel in Bristol in 1739, which can still be visited today. Matt Lucas, comedy actor and star of the highly acclaimed Little Britain television sketch show, studied Drama at Bristol University. Tony Robinson actor, trained with Bristol Old Vic and has lived in Bristol and also been active politically there, for nearly thirty years. He is known to television viewers for his part as 'Baldrick' in the comedy Blackadder. Richard Gregory, psychologist, resides in Bristol. Keith Floyd, TV chef, ran several restaurants in Bristol, and got his start in TV at BBC Bristol. Johnny Morris, TV celebrity, resided in Bristol, and made his television programmes at Bristol Zoo.